There are two Cape Kiwanda parks. The Tillamook County park includes the parking lot, while the state park contains the cape itself, and is located on the Three Capes Scenic Route. The action of wind and waves on the sandstone that forms the cape has created an interesting headland to explore. The "other" Haystack Rock can be seen offshore. The more famous one is near Cannon Beach. 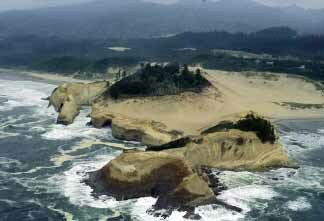 Cape Kiwanda is a popular spot for hang gliding and kite flying.